The traditional model of health (Biomedical Model) and thinking dictates that there is always a direct link between structural damage and pain, and by resolving this ‘damage’ you resolve the pain (Girbes et al 2014). We now understand that pain can be much more complex and this way of thinking does not always result in the resolution of pain (Nijs et al, 2013). 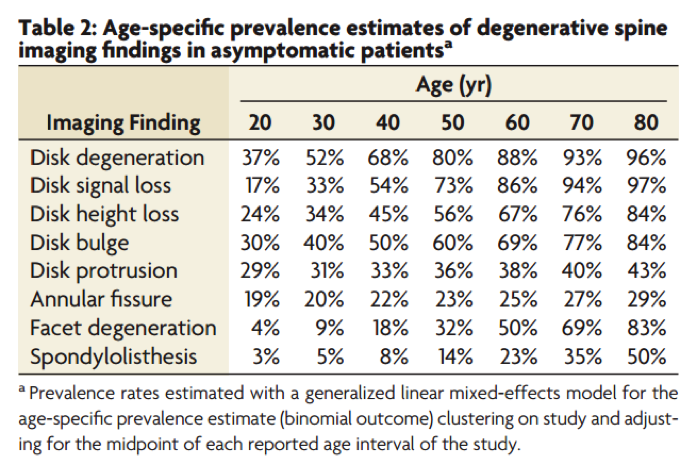 If we look at the table below, we can see that with each decade of life the prevalence of findings deemed to be degenerative or ‘damaged’, on scans (CT/MRI), increases. 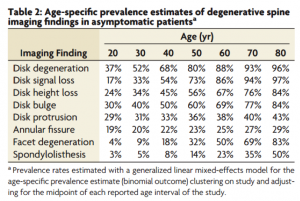 These findings are related to asymptomatic (pain free) patients. As a result we know view many imaging-based degenerative findings as a normal part of ageing (wrinkles in the spine if you will) and are not associated with pain (Brinjikji et al, 2015). We now think of pain as complex protective mechanism, that is created when our brain perceives us being in danger, because of information sent from our tissues. This can be influenced by our emotions, beliefs, expectations, and past experiences (Moseley, 2016). So why me, you ask yourself? Maybe you did roll your ankle or lift something incorrectly, maybe you had a big day in the garden and wake up stiff the next day, maybe your neighbour told you that you should get your back checked out before you really stuff it like your dad stuffed his back when he was 12, or maybe you have just had a stressful week to top it all off. These are all things you should discuss with your physiotherapist so you both can understand what is driving your pain. 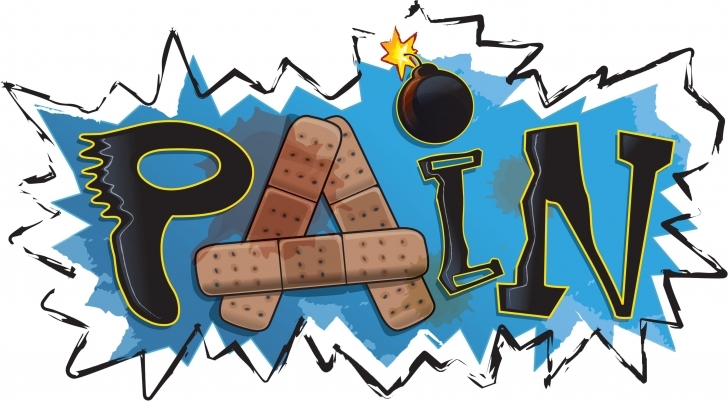 Now for the million-dollar question…what can you do to get rid of your pain? Knowledge. Knowledge is key. If you can understand why the pain started in the first place and what is driving it you will be able to manage your pain a lot easier. Your physiotherapist can help with this process of understanding, help settle the irritation, and devise a graded loading (exercise) plan to suit your current status that can be progressed as your pain settles so that you become stronger which will help prevent your pain from returning. If you have any questions or concerns, we encourage you discuss them with your physiotherapist. Next Trigger Point Dry Needling vs Acupuncture: What’s the Difference?